It's September and that means fall. And that means time for another wishlist, right? There's something about the start of a new month or season that just screams for a few new things to add. I'm really trying to buy clothing wisely and am actually just going to be investing in shoes or outerwear for the near future. You know, cute sneakers for work, new rainboots to replace my old leaking ones, and a sweatshirt to wear when it gets cold, too. And then, well, I've also added a book I'd love to read, a necklace I loooove, a new tote I'd love to store my Sunday School stuff in, and a few other fun goodies, too. What's on your fall wishlist? And since I mentioned sneakers, what are your favorite brands? I've been looking at Keds and Vans but just recently wondered if Converse are good, too. Thoughts? p.s. Do you have any Fall favorites? 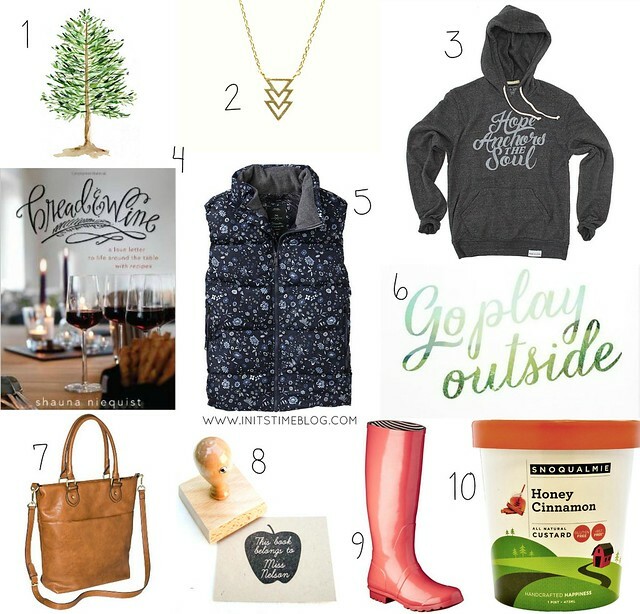 Because this month's The Circle is all about Fall faves. Join us on Wednesday, September 24th to find out what I love most about Fall! I could go for a pair of rain boots too - I love how similar those are to the Hunter ones, but sooooo much cheaper. That vest is so cute too - I get tons of use of mine. Always nice to have a layer that can go over anything for cool mornings. i want #2 also!! love that! Everytime I see a vest (that i love ps) I think if Flint's Dad on the second Cloudy With A Chance of Meatballs... "I don't get vests. Is it winter on the chest, and summer on the arms?" Love all of these! Checking out that bag, ASAP. And can't wait for the circle!! I'm in some real need of rain boots. I don't know how I survived growing up in Florida without them - I guess we just wore flip flops since it never got cold. Just rainy. AND I NEED THAT VEST. Like yesterday. On my fall wish list - crisp cool air. And bonfires. Lots of bonfires. And hooray! So glad you're excited about The Circle! Hahaha I remember that scene, too! I think I watched that movie with the kids I babysit. :) I've never owned a vest before but have always kind of wanted one. But Flint's dad is right, what season is best for it? I just wonder if my arms/hands will get cold! Isn't that necklace pretty? I've been falling more and more in love with gold jewelry and that would make a great addition to my jewelry collection! I agree! I spotted those boots on Target's website and I was amazed at how simple and Hunter-like they were. But I can't seem to decide if I want black or if I want a fun color. But I DO know I'll need them in a few months when the rain rolls around and I'm outside with preschoolers! And I've been looking for a vest for a couple years now but can never find one that I like fit/color/pattern/price wise. I'm a little picky so we'll see if I find one that I reallllly love this year! I'm hoping I get a chance to read it this year, too! It's been on my to-read list for awhile now. Have you read Shauna's other books? And isn't that vest adorable? I go between wanting a patterned one and wanting a solid color but I just can't decide. No, I haven't but I really want to! I've read Bittersweet and Cold Tangerines and loooved them. I hope you get a chance to read them soon! With the Etsy Swap happening, I've been on there A LOT this week. I have found so many cute things! As for sneakers. I go with Nikes for looks. Adidas for old times sake. New Balance for comfort. And I've had my eye on a pair of grey converse too. I haven't worn converse since elementary school, but I'm thinking I could pull them off again. Although, let's be honest...I really want the purple ones! lol :) What color are you thinking? AH! I LOVE that hoodie!! That is going on my wish list for sure!! I also love that bag!! I am really loving that caramel (is that the right name for it?) color for leather!! Those rain boots are too cute!! I bought rain boots a long time ago (I lived in the desert...why did I think I needed them? because they were only $5!) I just recently have been able to get some good use out of them but I would love another pair!! And I like the look of Nikes, too! I have a pair for running and would love another for work. I would go for Converse, but I don't like how they make my feet look bigger than they are (I'm weird like that, haha). I'd love to have some neutral ones like a grey or blue but I'm also open to colors if they're athletic shoes. Too many decisions and options! Me, too! Walk in Love is an awesome company and I've had my eye on pretty much all of their products. They sell some awesome stuff! Also, $5 rain boots? That's awesome! I had a cheaper pair from Target but they cracked because I wore them a lot because of all the rainy recesses I was outside for. I definitely need another pair before the rain starts again! That sweatshirt. And that necklace. So adorable!! I love this :) And I simply love your style! Your reason for avoiding converse is the exact reason I'm going back and forth! Love this post! How do you do these? Like the sweatshirt too--maybe in a different color. Pink would be cute! the vest is so cute! I have a few vests and love them! I even have fake fur one it's so warm! Boots are so cute! I approve of that color ;) I own a pair of hunter boots and I LOVE them! Those look kinda like them. That ice cream looks good too! And I will! I still haven't decided because I keep going back and forth, though! I just ordered Bread & Wine and I'm super excited to get it. I've been wanting it for a long time and it's about time I broke down and got it! And the sweatshirt unfortunately only comes in that dark grey color right now. Fortunately, I kinda like it anyway! But yeah, more colors would be fun! Oh you will love it girl! :) I will excited to see what you think. I really like the white ones too! But again...White shoes are just too hard to keep clean! :) I'll keep you posted! i. want. all. of. them. especially that bag! Sorry to barge in on the convo here... but Bread & Wine is SO GOOD!